Are you looking for Event Management Jobs? 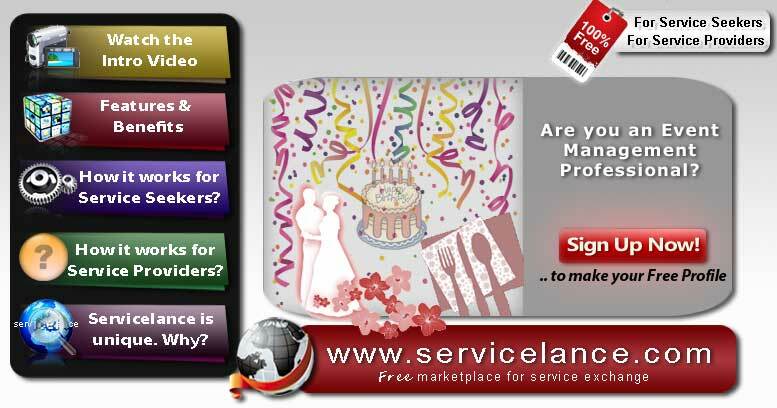 Make your FREE Event Management Service Provider Profile at Servicelance and get notified of event management jobs posted at Servicelance in your preferred local areas. SIMPLE, EASY & FREE! If you own an Event Planning and Management Company or you offer Event management services as an Individual or Freelancer, you have reached to the RIGHT place! Through Provider Search, get Free exposure to seekers who want to get their Event Managment jobs and related work done. Through Job Alerts right in your inbox, get notified for any Event Management Jobs posted at Servicelance, again for Free! Quote for free on the jobs you feel interested in. Close deals with seekers as you prefer - Get paid directly and quickly. Provide Event management services as an individual, self employed or business. Establish and promote your professional repution by writing articles. There are absolutely No Costs! Looking for Event Management Companies & Professionals for your event?